Following the quotes that make moments memorable back to memorable books. Well, I don’t know if that’s exactly true, but Top 10 lists are probably among the 10 most popular topics for blog posts these days. But for me, winnowing my favorite books down to 10 was no easy feat. As a writer I have an entire village of favorite books that inspire me on my shelves. (I live in a relatively small space, otherwise I’d have an entire metropolis of favorites!) But which ones might inspire you as well? To narrow it down, I began by flipping through the pages of Joy in Every Moment, my latest book, which includes quotes from many of the books that have inspired me to live my best life — one moment at a time. Then I added a few more to come up with a highlights list that includes books of poetry, philosophy, self-help, psychology, and fiction. I hope you find something here to inspire you! Enjoy. The Life of Pi, by Yann Martel: The fictional character, Piscine Molitor “Pi” Patel, inspired me to “choose the better story” — a reminder I turn to again and again. Leaves of Grass, by Walt Whitman: I re-read this book-length poem with a group of friends almost every year on the Fourth of July (the anniversary of the book’s publication). It takes us about two hours to read the entire poem aloud, and each time I feel inspired to try to do my part to live up to Whitman’s vision of true equality and democracy. Man’s Search for Meaning, by Viktor Frankl: A psychiatrist imprisoned in a concentration camp comes away recommitted to his belief that we can live positive and purposeful lives filled with meaning — no matter what the circumstances. Now that inspires me. 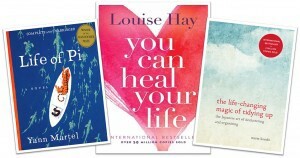 You Can Heal Your Life, by Louise Hay: As a young woman, this classic self-help book inspired — and empowered — me, to wake up to the role our thoughts play in manifesting our lives. Memories, Dreams, Reflections, by Carl Jung: My dreams are a constant source of inspiration to me. Jung’s work helps me to explore them, trust them, and find meanings within them. The Life Changing Magic of Tidying Up, by Marie Kondo: With joy as the organizing principle for getting one’s house in order, this quirky little book inspires me to experience my surroundings in a richer way! From Where You Dream, by Robert Olen Butler: This book inspires me to grab my pen, nearly as soon as I open my eyes in the morning — and start to write. Active Hope, by Joanna Macy and Chris Johnstone: I turn to this book again and again when I need to be inspired to live from my heart in a time of great challenges to our magnificent planet. Tiny Beautiful Things, by Cheryl Strayed: Pearls of wisdom wrapped in humor and humility and delivered with gloves-off, gut-wrenching candor — that’s what I call inspiration. Comfortable With Uncertainty, by Pema Chödrön: I have this book in paperback and in an MP3 file on my iPod so I can read or listen to it any time, including at 4 a.m. on nights when I can’t sleep. This book inspires me to face difficult situations and emotions with a loving heart. May these books inspire you, too. Or better yet, may you be inspired to share with others your ten most inspiring books! A note on item #6 above: Recently my book Joy in Every Moment was published as an audiobook. I am thrilled to announce that the narrator for the audio version of the book is Emily Woo Zeller, who also narrated Kondo’s fabulous book, The Life Changing Magic of Tidying Up. Click here to listen to an excerpt of Joy on audio … for FREE. This post was written in response to a question posed by the librarians at Boston Public Library, where I spoke as part of the Library’s Author Talks Series, upon publication of my book Joy in Every Moment: Mindful Exercises for Waking to the Wonders of Ordinary Life. Originally published at tziviagover.com on January 12, 2016. If you enjoy this post, please click the ❤ icon below, so other readers can find it, too!